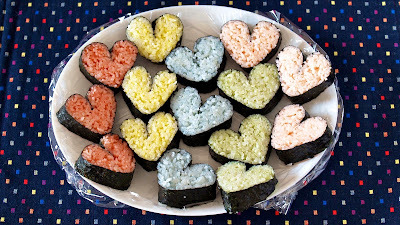 Cute substitute for Onigiri (rice balls). 2. Place a piece of plastic wrap on top of a bamboo sushi-roll mat. Place the seasoned rice, then wrap and shape it into a drop shape. Cut it into half. 3. Place 1/2 Nori sheet, shiny side down, on a bamboo sushi-roll mat. Remove the plastic wrap from the rice and place the rice in the center of Nori sheet. 4. Wrap the rice with Nori sheet. Then gently press the mat around the roll to shape it (do not squeeze). 5. With a moistened knife (bread knife cuts well) cut the roll into 3 pieces (re-wet as needed. don't push but pull to cut).